Mythic, worshipped in ancient Greece, exact dates uncertain, by the 6th century B.C.E. Ariadne was the daughter of the legendary King Minos of Crete. After helping her love Theseus defeat the Minotaur and escape the labyrinth, she was abandoned by him while asleep on the island of Naxos. According to some versions of the story, Dionysus appeared to her as she slept and commanded her to stay behind on the island so that he could marry her. Often associated with sorrow, due to her struggle between attaining personal happiness and obeying higher powers, Ariadne’s cult spread from Crete, where she was a goddess of vegetation, to the islands of Naxos, Delos, Cyprus, Chios, Lemnos, and was particularly strong in Argos. Titian. 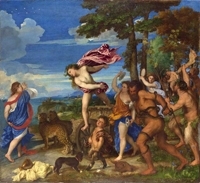 Bacchus and Ariadne, 1520–23. The National Gallery, London.